$0.99 Discounted through end of August! Felicity works in a millinery shop in upstate New York and her heart was broken when the man she was supposed to marry sent a letter announcing his marriage to someone else. 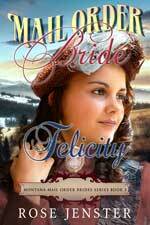 After shedding many tears, she answers a mail order bride advertisement and goes to Montana to meet the doctor. She did not think she could ever love again, but was happy to just be able to have her own home and family. Her feelings for Alec grew and her past hurt was healed. However, Alec became aloof and she felt very alone. Did their relationship stay flat or were they able to get past the barriers and find true love?